Coba Cocina Restaurant in Lexington, KY contains more than 60,000 square feet of glass, porcelain and ceramic interior and exterior tile, all installed with TEC® Power Grout®and IsoLight™ mortar. Check out these amazing installation pictures! The design of Coba Cocina was inspired by cenotes, a natural wonder found most often in the Yucatan Peninsula, where land has eroded over centuries to create a mystical underwater world. The focal point of the restaurant is an aquarium that is home to the largest private collection of moon jellyfish in the world. The project team decided that the best material to simulate the limestone bedrock and underwater atmosphere would be a variety of tile. TEC® Power Grout® Ultimate Performance Grout was used for all tile applications on Coba Cocina. It provides permanent stain resistance, crack resistance, efflorescence resistance and superior color uniformity. Power Grout is available in 32 color options that match the latest design trends. 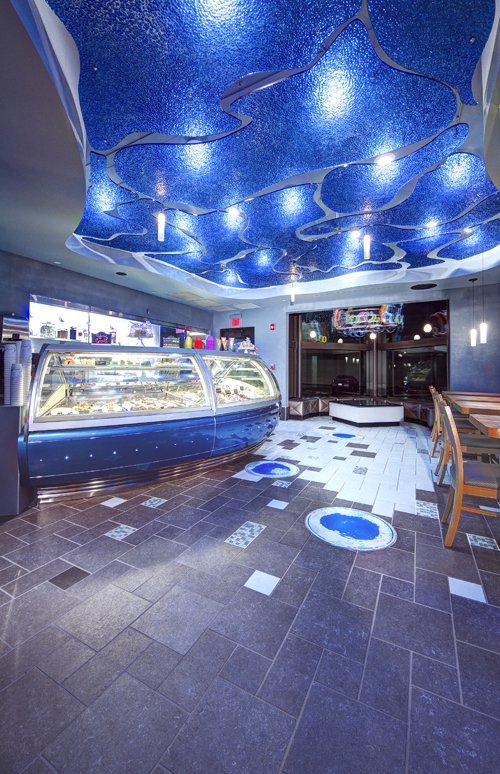 By using ceramic and glass tile of various sizes and colors, including iridized blacks, greens, golds, silvers and aqua, on the floors and walls, restauranters can experience a sense of underwater movement. TEC® IsoLight™ Mortar was used to set all of the tile. IsoLight™ is a lightweight mortar that protects tile from up to 1/8" substrate cracking from in-plane horizontal substrate movement. It contains recycled materials that enable superior handling and ease of use. Also, IsoLight™ can be applied over many substrates, an extra bonus for the installer. The exterior of the restaurant is covered in solid porcelain tile that gives it a travertine look. The large-format 12”x24” tile is set using the same TEC® products as the interior. IsoLight™ and Power Grout® are both ideal for outdoor installations. Coba Cocina was completed in spring 2013. The project team consists of architect CMW, Inc., Lexington, KY, tile installer May Contracting, Lexington KY, and distributor Louisville Tile, Lexington, KY.